LOCATION: Lennard Island Lighthouse, off Long Beach, three miles from Tofino. 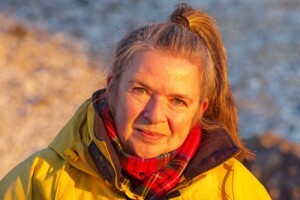 Situated at Latitude 49 degrees 6″ 37′ and longitude 125 degrees 55″ 23′, Lennard Island has been home to lightkeeper Caroline Woodward, a former bookseller-turned-author, since 2008. It takes her and her husband Jeff roughly 20 minutes by power boat to get to Tofino or one hour by kayak going with the tide. In 2015, she published Light Years: Memoir of a Modern Lighthouse Keeper. Born in Fort St. John on March 14, 1952, Caroline Hendrika Woodward was raised on her parents’ homestead at Cecil Lake, B.C. in the North Peace River region. She began her writing career in 1968 with a two-year stint as a weekly columnist for the Alaska Highway News in Fort St. John where she first encountered the formidable newspaperwoman, Ma Murray. She earned a B.A. and Teacher’s Certificate from UBC where she minored in fine arts history while acquiring her B.A. major in anthropology/sociology. Along the way she took studio classes with Toni Onley and studied First Nations art with Audrey Hawthorn. Before she also gained a Diploma in Creative Writing from David Thompson University Centre in Nelson, B.C., she undertook paid and volunteer work in Sri Lanka, India, Nepal and Europe. 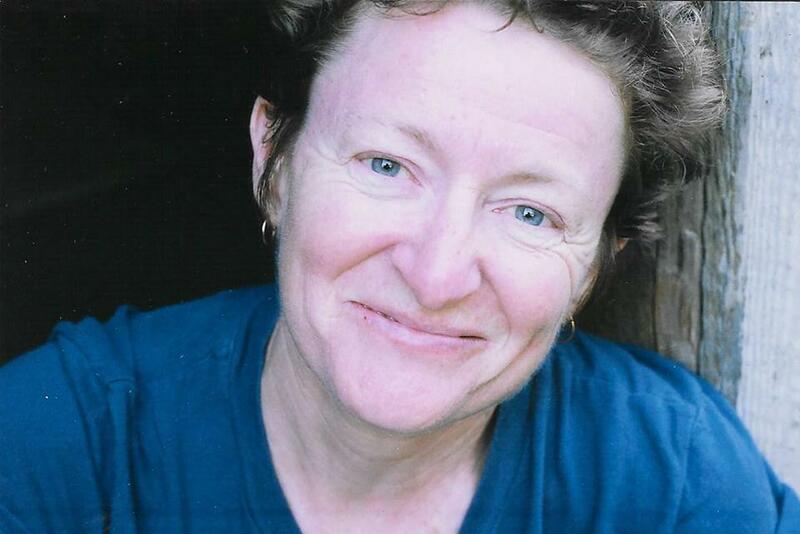 Woodward published travel articles in Canadian newspapers and magazines such as Miss Chatelaine (Solo bicycling across Greece-May, 1976) and in 1981, she wrote, designed and self-published A Blue Fable, printed on 12 pages of rice paper in Kathmandu, Nepal. This endeavor introduced her to the nuts and bolts of promotion, distribution and retailing in the Canadian book industry. Her experiences as a writer and bookseller led her to work as a publishers’ representative for Kate Walker & Company, based in Comox on Vancouver Island in 2001. “I’ve always been very happy as a kind of cultural midwife for talented artists,” she says. 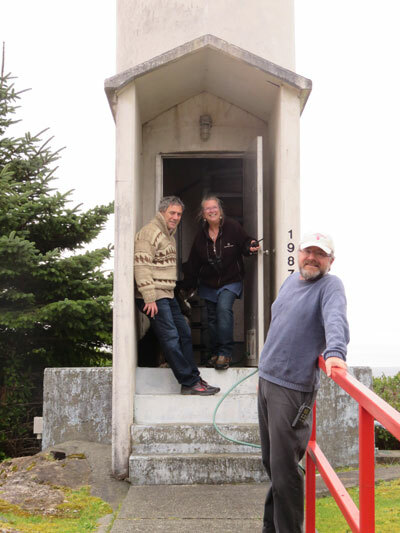 Even though it was her literary job with a dental plan, she left in 2008 to join her husband Jeff, an Assistant Lightkeeper, at Lennard Island Lightstation, near Tofino, where she has been able to re-refocus on writing. Woodward simultaneously released two new books in 2010, “both of them springing (or glacially proceeding, more like it) from my Peace River roots.” A West Coast-themed retelling of The Odyssey, Penny Loves Wade, Wade Loves Penny (Oolichan, 2010) is about an ‘inventive and resolute ranch wife’ and a ‘reluctant rancher and good man, adrift behind the wheel on his last long haul truck run of the season.’ Her other Peace River book, Singing Away the Dark (Simply Read Books 2010), is an autobiography that tells the story of her mid-winter mile-long walk to the school bus stop, through a dark tunnel of trees, four barbed wire gates, past a herd of cattle and a cranky bull, and across a field where the north wind always blew hard. Dedicated “To Peace River children who are all brave and tough,” it has been translated into French, Korean and Bulgarian editions. Woodward has since earned her assistant lightkeeper qualifications to do (lightkeeping) relief work at the station, and other stations, on the west coast. She now happily writes on her rocky island “in-between doing weather reports, painting, power-washing and lawn-mowing.” Her long journey to literary productivity has resulted in a memoir that has emerged largely from her lightkeeping days and nights on the West Coast. Of the several previous books about lighthouses in B.C., none are more essential reading than Don Graham’s Keepers of the Light: A History of British Columbia’s Lighthouses and Their Keepers (Harbour 1985) and his second volume, Lights of the Inside Passage: A History of British Columbia’s Lighthouses and Their Keepers (Harbour 1986), both written to protest the impending widespread curtailment of manned lighthouses in Canada. Born in 1945, Graham was a Cultural Conservation Coordinator for the Province of Saskatchewan prior to becoming a British Columbia lightkeeper in 1976. He worked at Bonilla Island in Hecate Strait, at Lucy Island near the mainland and east of the northern Queen Charlottes and finally at Lighthouse Park in West Vancouver. With an M.A. in history,. adept at political science, he spearheaded the partially successful campaign to halt replacement of manned lighthouses with strictly automated signals. His two books reveal that many of B.C.’s lightkeepers were under-paid working class heroes. The first won the Roderick Haig-Brown B.C. Book Prize in 1986. Graham continued to live at the Lighthouse Park light station after it was officially ‘de-manned’. 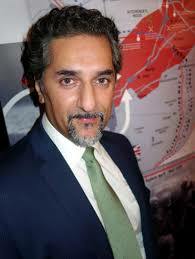 Graham also caused a stir for claiming on CTV national news that the Allies had deliberately shelled the Estevan Point Lighthouse on the West Coast of Vancouver Island in 1942 to whip up war fever. This attack led to the expulsion of Japanese Canadians from the West Coast. Don Graham died of cancer in October, 2003. Finalist for 2010-2011 Amelia Frances Howard-Gibbon Illustrator’s Award. Canadian Children’s Book Centre Red-Starred Our Choice Award. Caroline Woodward made Nelson, B.C. her home base from 1983-1991 where she continued to publish non-fiction articles, short stories, poetry, plays, book reviews and artist profiles for an assortment of media. The writing teachers she salutes from this period are Colin Browne, Paulette Jiles, John Newlove and Clark Blaise. She also became very involved with the Kootenay School of Writing as a volunteer organizer and instructor and with a plethora of other arts organizations in and around Nelson. 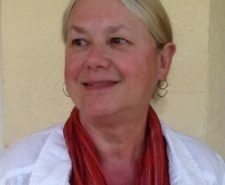 She started her long association with Polestar Press as a manuscript reader, author tour organizer, publicist, in-house editor and occasionally, managing editor. She also began her enduring friendship and collaboration with Paulette Jiles in the mid-1980’s, which resulted in several CBC Radio productions and a stage production, “For the Daughters”, a fundraiser for local scholarships for women, among many other informal antics like their Starving Artist Dinner Parties. Woodward’s first collection of short fiction and prose poems, Disturbing the Peace, evoked her Peace River roots and was nominated for the 1991 Ethel Wilson Fiction Prize. Stories from this book have been reprinted in Canadian anthologies, many of which are used in high school and university English courses. Bravo TV adapted one story for its Spoken Word series of dramatic monologues. Her first novel, Alaska Highway Two-Step, is a road story containing a mystery, and was nominated by the Crime Writers of Canada for the Arthur Ellis Best First Mystery Novel category in 1994. She was then invited to be a panel presenter at the 1994 International Bouchercon Mystery Writers Conference in Seattle, Washington. Always very involved in the rich cultural life of the Kootenays when based in Nelson (Kootenay School of Writing, Theatre Energy, Kootenay Lake Summer School of the Arts, Images Ad Hoc Singers to name a few), things got even busier in the village of New Denver. As well as helping to run the Motherlode, Caroline served as the Kootenay rep for the Federation of BC Writers (1994), served on the Board of Selkirk College for three years, joined the Valhalla Community Choir (go to CBC Radio’s OutFront site for Keep On Singing, Woodward’s homage to singing in choirs nearly all her life), joined the Board of the Slocan Lake Gallery Society for seven years, served on the arts and culture advisory committee of the Vancouver Foundation for six years and was appointed Vice-Chair of the inaugural B.C. Arts Council with Mavor Moore as Chair. While serving with the latter, she spearheaded the Youth Employment Program in the Arts to offer tuition credits and to mentor young people in cultural work, a successful and much-needed transfer of specialized knowledge program, which was slashed by the provincial Liberal government in 2001. Woodward first began teaching creative writing classes in 1985 and has since taught hundreds of workshops and courses ranging in length from half a day to a full four-month term for organizations as diverse as the Lasqueti Island Arts Council, the Sechelt Festival of the Written Word, the Kootenay School of the Arts, Elder Hostel, and three BC Festivals of the Arts. She has taught writers aged 8 to 80 plus and she has given over 100 public readings across Canada from Whitehorse to Montreal, from Dease Lake to Ottawa, from Calgary to Pouce Coupe. Now a relief assistant lightkeeper based on the Lennard Island Lightstation near Tofino, Caroline Woodward also worked as a sales rep for publishers for Kate Walker & Co. “from Chemainus to Smithers” for seven years. She’s hitting the road again, this time she’s promoting two new titles of her own “springing (or glacially proceeding, more like it) from my Peace River roots.” Her novel Penny Loves Wade, Wade Loves Penny (Oolichan $18.95) is a contemporary retelling of The Odyssey, an enduring love story between a resolute Peace River ranch wife and her good husband, adrift behind the wheel of his long-haul truck bound for the west coast and southern interior. Singing Away the Dark (Simply Read $18.95), a children’s picture book illustrated by Julie Morstad, is based on Caroline’s coping skills learned during midwinter one-mile walks to the Cecil Lake school bus stop in Grade One, through barbwire gates, a scary dark trail, past a cranky bull in a barnyard and finally, enduring a northern blizzard. Woodward’s October book tour included over 25 events in 16 cities, towns and villages. “I love driving,” she says, “and I welcome the chance to organize my road maps and hit the road again.” Born in Fort St. John and raised on a homestead at Cecil Lake, the former Kootenay bookseller began her writing career with a two-year stint at the Alaska Highway News while she was a high school student. They say “it takes a village” to raise a child and to care for families in crisis. It takes both a child and a village and a wise hat-maker in Caroline Woodward’s first chapter book for 8-to-11-year-olds, The Village of Many Hats (Oolichan $9.95). As the protagonist nine-year-old Gina struggles with her sister’s illness, tragedy within their mountain village of Silverado brings the community together. 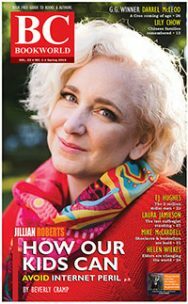 With her literary roots in the Peace River, Woodward, born in Fort St. John, is also moving onto new ground geographically with The Village of Many Hats, setting her uplifting story in the Kootenay and Slocan valleys of southeastern B.C. where she founded a bookstore. “Outside the vibrant cultural life and amenities of cities,” she says, “I have to say that the rural and semi-rural Kootenays possess the people, the wilderness, the do-it-ourselves attitudes and the persistence to keep the arts in all its forms thriving. Woodward lived for eighteen years in the Kootenays: on the north shore of Kootenay Lake, attending the visionary, late, still-lamented David Thompson University Centre in Nelson. In Winlaw, she also worked in various capacities for Julian Ross and Ruth Porter at Polestar Press. “I remain inspired by the work of so many talented and generous community organizers and artists I’ve met, collaborated with and still sing the praises of in The Village of Many Hats. “Did I say that I intend to live in the Kootenays again? Well, I do!” says Woodward, who currently lives near Tofino. The name of the village in her book combines one of the early names for present-day New Denver — El Dorado — and Silverton, a village on the shores of Slocan Lake, only five kilometres to the south of New Denver. “Silverado is more than just the name brand of a truck!” says Woodward. After the province withdrew 100% of its funding for the New Denver Reading Centre, Woodward posted her work-in-progress online and auctioned off roles in the story to five ‘real’ people who have contributed over $900 to support the centre: Heather Fox, Dr. Jamie Barber, Judi Gardiner, Wendy Harlock, and Francie Oldham. In 1993, Caroline Woodward, with her partner Jeff George, renovated a circa-1900 building on the main street of New Denver, B.C., population 700, and opened the Motherlode Bookstore. Also an author of three books, Woodward later worked as a publishers’ sales representative for Kate Walker & Company, based in Comox, starting in 2001. But the literary life can be a hard slog. At the outset of her new book, Light Years: Memoir of a Modern Lighthouse Keeper, she describes how a pivotal meeting with a middle-aged man on the Alert Bay ferry changed her life. He was on his way to a new job as a relief lightkeeper, enabling him to escape from a dull civil service career in B.C.’s interior. Woodward was struck by “how his face lit up when he said how he felt truly, deeply alive upon arriving in Port Hardy… And wasn’t that exactly how I missed feeling? “And wasn’t that even more the case for my husband, who had dutifully worked at all kinds of low-paying, part-time jobs with awful hours for years on end? After Jeff George first gave lighthouse keeping a try, and liked it, Caroline Woodward packed in her job as a publishers’ sales rep and joined her partner on hard-to-approach Lennard Island, offshore from Tofino, where she subsequently gained her credentials as a keeper of the light. Here Sheila Peters outlines how Woodward’s irrepressible curiosity and enthusiasm turned a chance encounter on a B.C. Ferry into a life line. Like any good storyteller, Caroline Woodward runs many threads through her rich storybook quilt of history and memoir. On the personal side, she takes us back to her childhood on a farm in B.C.’s northeast and her breakthrough writing year at David Thompson University where she met her husband, Jeff George. 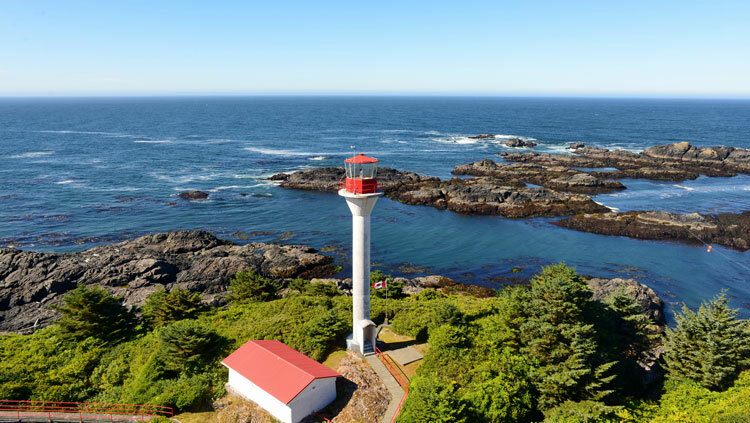 On the historical side, we travel back to the early days of lighthouse keeping in B.C. and forward to the heated battle to keep at least some of those lighthouses staffed. As these storylines are connected, Woodward’s determination to reclaim her and her partner’s creative life amounts to a powerful story. Woodward’s narrative mentions the dozens of jobs she had previously, from her childhood on her parent’s homestead in remote Cecil Lake, B.C. in the North Peace River region to her teenage days writing for Ma Murray’s Alaska Highway News to planting rice in Sri Lanka and running a bookstore (to mention only a few). As well as providing fodder for her writing, she says, these varied experiences made her a good fit for the varied tasks of a relief lighthouse keeper. Woodward sticks up for B.C.’s always-endangered lighthouses just as strongly as she sticks up for herself. Light Years is full of stories of lives saved, disasters averted and comfort brought to people caught out by wind and waves. Excerpts from keepers’ letters reveal some of the challenges they faced as tsunamis destroyed their homes or supply ships couldn’t get to increasingly hungry families. And if you’ve ever wondered exactly how visibility, the height of the waves, or the wind speed are determined, Woodward reveals the tricks used to compile the weather reports keepers file daily, beginning at 4:40 a.m. and finishing at 10:30 p.m. Along the way, Woodward rarely misses an opportunity to throw in arcane facts. It was Robert Louis Stevenson’s engineering father who invented the Stevenson screen, a slatted box still used to house maximum/minimum thermometers. As exuberant as any wild coastal landscape, Light Years has sections on gardening that include how-to cope with extreme coastal climates or soil contaminated with diesel spills, babying seedlings shared with other keepers and pruning a beloved David Austin tea rose. In spite of the complications of shipping food to such remote locations, celebrations of good eating are epic (if Woodward ever invites you to dinner, accept!). Best of all, she slips her sense of wonder into every chapter. Photos are by Jeff George. And, yes, some of the romanticism most of us automatically associate with lighthouses is in evidence. “I slept and slept on Egg Island,” she writes, describing one of her numerous relief stints at other lighthouses, “with only the sounds of the wind in the evergreens, the cries of the sea birds and the comforting push and pull of the ocean swells. Woodward’s need for solitude combined with her powerful sense of connection to people and place has stood her well in her work on the lights and as a writer. Light Years is a passionate and generous celebration of both endeavours and the people who do them. And any writer looking for ways to re-start a stalled career would do well to consider her example: Light Years is Caroline Woodward’s fourth book since moving to keeping the lights in 2008. Sheila Peters writes and publishes from Smithers.